I thought the photo would be the best way to introduce this one. See how I made it all fancy with the pastry leaves? 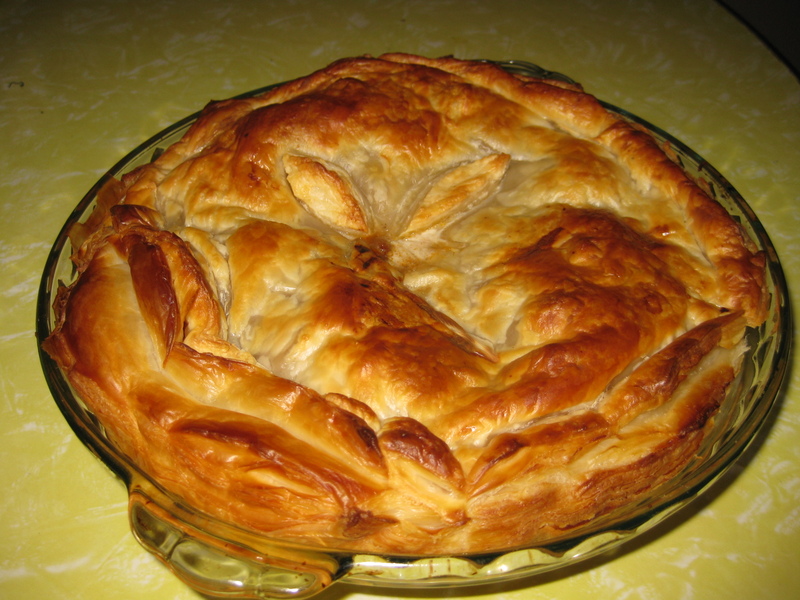 Now this pie is not a fancy thing, it is an easy thing to do with impressive results, all thanks to a couple of sheets of butter puff pastry and a crappy cut of beef. 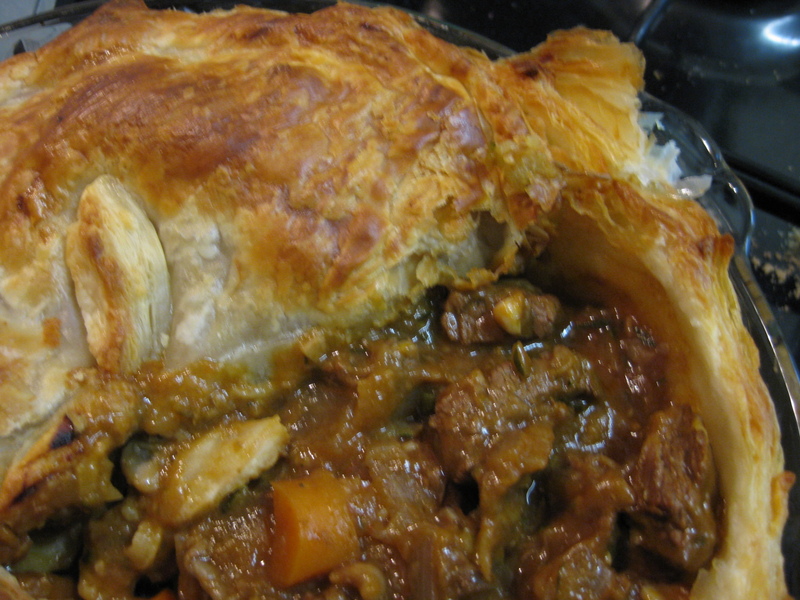 So here the recipe is for the meat inside the pie, and the only issue is that it takes time to cook because it is made with chuck steak or gravy beef or some other cheap yet tasty cut of beef. My recipe, as you will soon discover, is not so much a recipe as a guide. I use whatever I have handy and there are a only a few things you really need to make this recipe, and the rest is all just extras. Diced mushrooms and carrot, even celery if you want. Tin of Guinness (or probably any type of beer or wine wouldn’t harm either, if you didn’t have any stout around…red wine would give it a bourguignon vibe which is never a bad thing). Turn heat up to high, get the pot hot and then throw in the meat, and brown it. Then throw in any veges you want to put in, give them a stir for a minute or so. Then pour in water or stock or guiness, and tomato paste/sauce and any sauces you want to put in. Stir up all of the tasty goodness that has accumulated on the base of the pot. Then bring to boil for a moment, then turn heat right down to lowest and simmer on low for as long as you can. I suggest hours, but in a pinch, one hour will do. Brush pie tin with some oil, then line with pastry. Tip in beef, cooled if possible, but not essential. Cover with pastry. Cook until it’s done. You’re only waiting for pastry to cook and beef to heat, so as long as the pastry is cooked, it should be fine. I think at least twenty minutes. If you’re short on time, as logic would dictate – cut the meat smaller….If you don’t already know this, cheap cuts are tough, so they need a long time to tenderise, and on low heat. You could use a better cut of meat (perhaps round steak) if you have less time, but I think the flavour may lack, but then you could add beef stock. Butter Puff is what I use but you could also use short crust if you wanted. I can get away with two sheets of pastry. I put one piece as the base, supplementing the edges with the 2nd piece and then because there isn’t enough left of the 2nd piece to cover the top entirely, I cut it into strips and make a lattice type of thing. Economising at it’s finest. Cut a hole in the top of the pastry if you’ve got it completely covered in pastry…like a steam hole. sounds and looks great, lara. I like the look of these pie,will have to try it and I’ll let you know how I go. yummy!